AF Holdings LLC, Baseprotect UG Ltd., California (CA), CineTel Films Inc., Copyright Enforcement Group (CEG-TEK), Digital Sin, Discount Video Center Inc., District of Columbia (DC), Dunlap Grubb & Weaver PLLC, Evan Stone, Family of the Year Productions LLC, FUNimation Entertainment, Ira Siegel, LFP Internet Group LLC, Maryland (MD), McDaniel Law Firm, New Jersey (NJ), Nicholas Kurtz (Formerly DGW), Patrick Collins, Prenda Law Inc., SBO Pictures Inc., Steele Hansmeier PLLC, Texas (TX), Third Degree Films Inc., Thomas Dunlap (DGW), Timothy Anderson, Torrent, Uncategorized, Zero Tolerance Entertainment Inc. 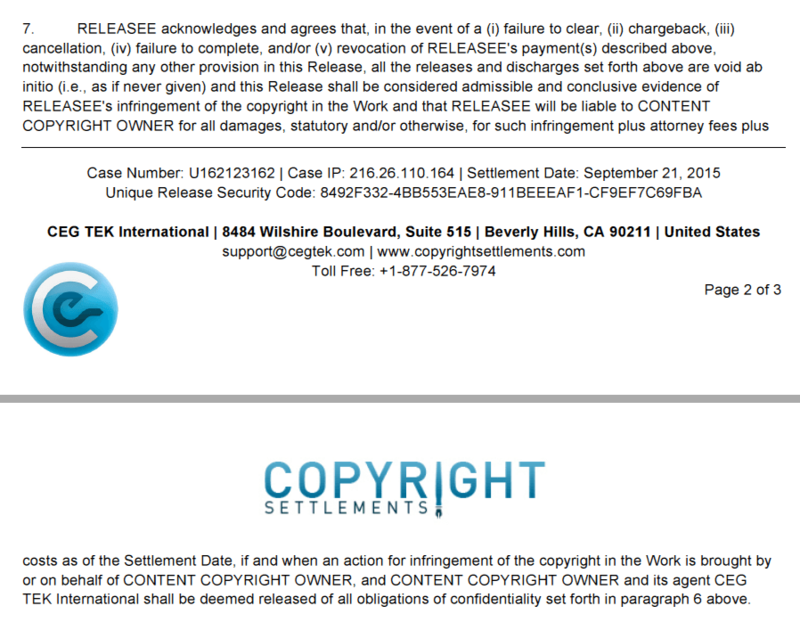 Which will be the bittorrent lawsuits of tomorrow? With the larger cases from Dunlap Grubb & Weaver, PLLC heading off into the bittorrent litigation graveyard, the plaintiff attorneys have not yet learned their lesson about the dangers of filing John Doe lawsuits with thousands of Does sued together. Below are just a few cases filed by the same plaintiff attorneys — newer cases — which thus far have not achieved much traction. No doubt we’ll be seeing more of these in the coming months. First and foremost, Ira Siegel’s new case, Digital Sin, Inc. v. Does 1-5,698 (Case No. 4:11-cv-04397-LB) filed in the US District Court for the Northern District of California. Apparently it did not occur to his client that suing 5,698 defendants is the easiest way for a case to achieve scrutiny. Also by Ira Siegel is his SRO Pictures, Inc v. Does 1-3036 (Case No. 5:11-cv-04220-PSG) case, his Discount Video Center, Inc. v. Does 1-5,041 (Case No. 5:11-cv-02694-PSG) case, his Zero Tolerance Entertainment, Inc. v. Does 1-2,943 (Case No. 3:11-cv-02767-EDL) case, each filed in the same California court as Digital Sin. We are already hearing from Doe Defendants on Ira Siegel’s Third Degree Films, Inc. v. Does 1-3,577 (Case No. 4:11-cv-02768-LB) and most notorious, his Patrick Collins, Inc. v. Does 1-2590 (Case No. 3:11-cv-02766-MEJ) case, also in the same California court. Next, filed by Thomas Dunlap himself (of Dunlap Grubb & Weaver, PLLC) is CineTel Films, Inc. dba Family of the Year Productions, LLC v. Does 1-1,052 (Case No. 8:11-cv-02438-JFM) filed in the US District Court for the District of Maryland. This one should be fun. This same plaintiff has had Dunlap sue in his home US District Court for the District of Columbia, the Cinetel Films Inc. et al v. Does 1-1,951 (Case No. 1:11-cv-01334-RLW) case. Same plaintiff, different jurisdiction. My guess is that Ellis Bennett or Nicholas Kurtz will be the on the paperwork for these since they have to date handled Dunlap Grubb & Weaver’s older cases. In the District of Columbia (where most of Dunlap Grubb & Weaver’s cases are filed,) to everyone’s surprise is the AF Holdings, LLC v. Does 1-1,140 (Case No. 1:11-cv-01274-RBW) case, apparently using Timothy Anderson of Anderson & Associates, PC as the local counsel. The funny thing about this one is that AF Holdings, LLC is John Steele of Steele Hansmeier PLLC’s clients (where Steele Hansmeier has sued a bunch of AF Holdings, LLC v. Does smaller cases across the country already), so this Tim Anderson guy is probably another one of Steele’s local counsel puppets (sorry Tim). Then, there is Evan Stone’s FUNimation Entertainment v. Does 1-1,427 (Case No. 2:11-cv-00269-DF) filed in the US District Court for the Eastern District of Texas. I haven’t heard much about this case yet, but Evan Stone is the attorney who was the plaintiff attorney over the LFP Internet Group, LLC v. Does [LFP a.k.a. “Larry Flint Productions”] lawsuit that had over 6,000 defendants in total dismissed last year. Maybe he’s back in the game with a case that won’t be immediately dismissed. Last, but not least, there is a set of triplet lawsuits filed by an unknown McDaniel Law Firm plaintiff (probably a copycat attorney who has watched these bittorrent cases develop and now has decided to try his hand and sue) in the US District Court for the District of New Jersey. Both of them go by the same name, Baseprotect UG, Ltd. v. John Does 1-X (Case No. 2:11-cv-03621, Case No. 2:11-cv-02021, and Case No. 2:10-cv-06806 respectively). The deceptive part is that the “Does 1-X” title appears to suggest that there are just a few defendants, so the case is hoped to stay under the radar. Nope. In one case, I believe there are over 300+ John Doe defendants implicated, and in the other case, I believe there are over 1,500 John Doe defendants. Funny enough, I hear that Baseprotect does not even own the Polish copyrights they assert, and that they have merely questionably acquired a limited right to sue on these copyrights. This will be fun to watch. So in short, with the demise of the famous DC cases (Maverick Entertainment, Call of the Wild, and now West Coast Productions, Inc.), there are a whole new generation of cases who hope to achieve exactly the same purpose as their predecessors. Make a profit before getting dismissed into oblivion.